Until a week ago, I’ve generally gone to my local supermarkets to obtain the various and sundry beers that fill up an embarrassingly large portion of my fridge. Roth’s is a standard grocery market that does a nice job of stocking craft beers, and the local organic food market, Lifesource, keeps an excellent (if small) selection of more eclectic brews on hand. These, along with kind contributions from friends in various locations with access to different regional breweries, have kept me going along happily enough. Last week, however, my beer options gloriously expanded by an order of magnitude. In preparing for last week’s Beertail Conundrum, I stopped by my local liquor store for a bottle of rum. While I was chatting with the proprietor, I asked in passing where the best beer selection in town might be found. He mentioned a tiny corner store in a somewhat grizzly neighborhood that I vaguely remembered having driven past before, but had never had occasion to enter. I had a few minutes to kill, so I popped over to see what the story was. And man am I glad I did. I walked in the door of the Capital Market (amusingly misspelled, as I assume it’s named for the fact that it’s ten blocks from the Oregon State Capitol) to find that it looked as seedy on the inside as the outside would suggest. They serve a small selection of really grim looking hot dogs and mystery fried stuff, and otherwise have primarily cheap junk food on the shelves. This didn’t instill confidence in their beer selection, but when I walked toward the back I was greeted with such a miraculous sight that I swear I heard, for just a moment, an angelic chorus singing Rachmaninoff’s O Gladsome Light. What I beheld in that moment was 36 glass doors (I counted), behind which were nothing but refrigerated beers from all over the country and the world. They were in fact organized and labeled by state or country of origin (which I’m not sure is the best system, but I’m not complaining). In addition they had about a hundred feet of shelves, front and back, which also held nothing but beer. Craft beer, cheap beer, singles, six packs, cases, bombers, it was all there. Hell, they had more different cans/bottles of Guinness alone than many stores have different varieties of beer. I barely got out of there with my sanity, as I was on my bike and could only fit a few bottles in my bag. 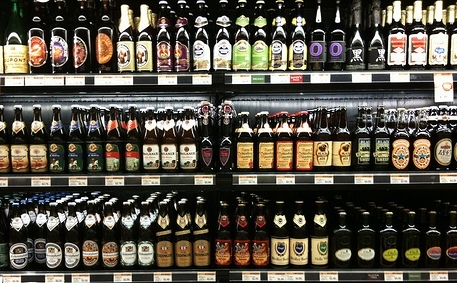 Deciding what to take home when there were so many beers I’d been eagerly hunting for was a nearly insurmountable task. In the end I was only able leave at all because I remembered that the store would probably still be there tomorrow. 1) The guy behind the counter at your local liquor store knows stuff. Just ask him. 2) You never know where these hidden gems may lie. Leave no stone unturned in your search for great beer. 3) Don’t go to the Capitol Market after 7:00 p.m. That’s when the winos come out. Posted in Alehouses.Tagged Beer Sellers, Capital Market, Oregon, Package Store, Salem. See what a good Ivy education can get you? I’m not questioning the manliness of your post… just sayin’. I grabbed a Hair of the Dog Ruth, and Hair of the Dog Adam, a sixer of Full Sail Special Edition Lager (for the beertail conundrum), a four pack of Maui Coconut Porter (thanks Bro. Barley for introducing me to that one), and a bomber of Stone Ruination. Commander, I think you might have to take some responsibility for the ads showing up in your gmail inbox.